In the recently published report of Pakistan Automotive Manufacturers Association (PAMA), car sales have reached 201,134 units for July 2017 to May 2018 period, showing an increase of 16% when compared to the same period last year. However, if the May 2018 sales are compared with the sales of April 2018, the overall car segment has seen a great decline of 15% and SUVs/MPVs have gone down by 6.5%. According to many analysts, the continuous price hike by local auto manufacturers, a restriction to buy cars for non-filers, and a slow pace of work during Ramadan could be the possible reasons for the decline in car sales on a month-on-month basis. Though the bike segment has seen an increase of 4% to 169298 units month-on-month basis. Furthermore, according to PAMA’s report, the percentage increase of 1300cc car segment is 4.4% from 88434 to 92299 total units from July 2017 to May 2018. In 1000cc cars, the total units sold increased from 31245 to 45647 with an increase of 46% and in 800cc or below, the total car sales percentage face a slight decline of 0.038% when compared with the sales of the same month a year earlier. In 1300cc cars segment, the overall sales increase by 4.3% cumulatively from the same month last year. 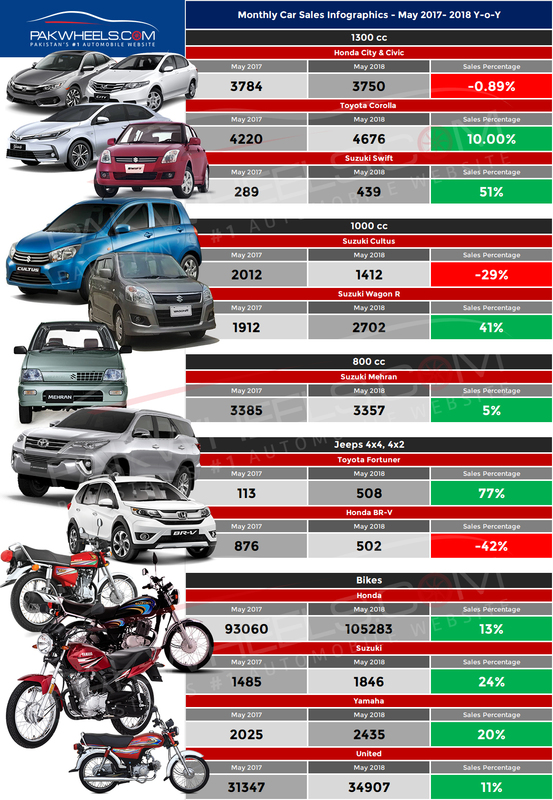 However, Honda cars, City and Civic, have seen a slight decline by 0.89% with 3750 units sold in May 2018. Suzuki Swift’s sale has gone up by 439 units sold in May this year, and if compared with the sales of the same month last year (289 units sold), Swift’s sale increased by 51%. Toyota Corolla stayed strong in sales with 4676 units sold in May 2018. And if compared with the sales of the same month last year (4220 units sold in May 2017, the sales of Corolla have gone up by 10%. However, on a month-on-month basis, there is a decline of 5% from April 2018 to May 2018. The overall car sales in the 1000cc segment have gone up by 4% to 4114 units sold, compared with May 2017 in which 3939 units were sold. Suzuki Cultus has seen a drastic decline by 29% to 1412 units sold in May 2018. Last month, in April 2018, the sales of Cultus were fairly high with 2085 units sold. The sales of Suzuki WagonR, on the other hand, rose by 41% to 2702 units sold in May 2018 and 1912 units sold in May 2017. However, just like the rest of the cars, its sales have also declined when compared with the sales of the last month, which was 3053 units sold. The cars in the 800cc segment have seen a slight decline of 0.03% in the overall sales in May 2018. When compared with the last month, i.e. April 2018, the sales have gone down by 23%. However, month-on-month basis, the sales of Suzuki Mehran has gone up by 5% with 3557 units sold in May 2018 and 3385 units sold in the same month last year. There is an overall decline of 6.5% in the sales of SUVs and MPVs from last month. In May 2018, 1010 units were sold, and 989 units were sold in the same month a year earlier showing a decline of 2% in the sales. However, if compared individually, then Toyota Fortuner’s sales have gone up by 77% on a month-on-month basis with 508 units sold in May 2018 and 113 units sold in May 2017. In MPVs, the multi-purpose vehicles that are considered best for large families, Honda BR-V has faced a decline of 42% in sales with 502 units sold in May 2018. Last year in the same month, the total units of BR-V sold were 876. As mentioned above, the bikes segment has seen an increase in sales of 4% overall. Honda sold 105,283 units in May 2018 with an increase of 13% from May 2017, in which there were 93,060 units were sold. With an increase of 24%, 1846 units of Suzuki bikes were sold in May 2018. However, last year in the same month, the total sales was 1485 units. With 2435 units sold in May 2018, there is an increase of 20% in the sales of Yamaha on a month-on-month basis. The total sales of United bikes increased by 11% on a month-on-month basis. This year in May 2018, the total units sold were 34907 and 31347 units sold in May 2017. Because non filers have started to buy cars through other means . Most of them are invoiced months ago due to premium . If you see USA that they discontinuing Ford Sedans and discontinuing every cars except mustang which will be kept and ford will only sell SUVS, Crosses and Pickups, then see our sales of SUVS with USA's FORD PRODUCTION.